Outside the storm rages, the wind and rain swirling in concert with a fury of ocean waves below. 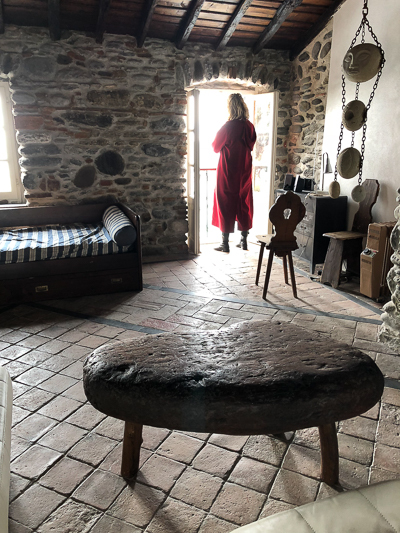 Inside we sit with lap blankets, cozy and safe atop a stone cliff in our Vernazza apartment overlooking the sea. A hint of cigarette wafts from two floors below where workmen renovate a unit in this building of unknown age. They smoke and they sing. As we pass the workmen on our way to lunch, we stop to chat. Nearly every Italian under age 40 speaks English because that’s when they started teaching it in schools. Perhaps these guys are young enough to understand us. I resort to Spanish, something that often does the trick in Italy. ”¿Cuántos años tiene este edificio? 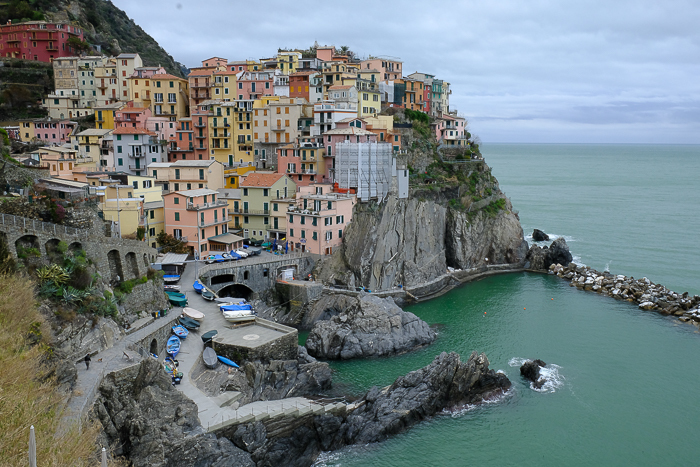 Manarola and Corneglia are two other villages of the Cinque Terre. We wave goodbye, off on the prowl for some nice gnocchi with pesto sauce. I miss our green trees in Oregon, but appreciate the stones of the Cinque Terre more and more. They keep us on solid ground above the salty waters and provide sturdy walls in this apartment. They terrace the hillsides and form mosaics in the streets and squares here. In Venice and Ravenna, we studied glass mosaics on the walls and ceiling. Here in the Cinque Terre we keep an eye out for the many stone mosaics at our feet. Jim takes photos of the stone patterns; he’s collecting ideas. Post-retirement, he plans to decorate the outside of our sad little backyard shed. We discuss using our overseas trips as shed-design inspiration. 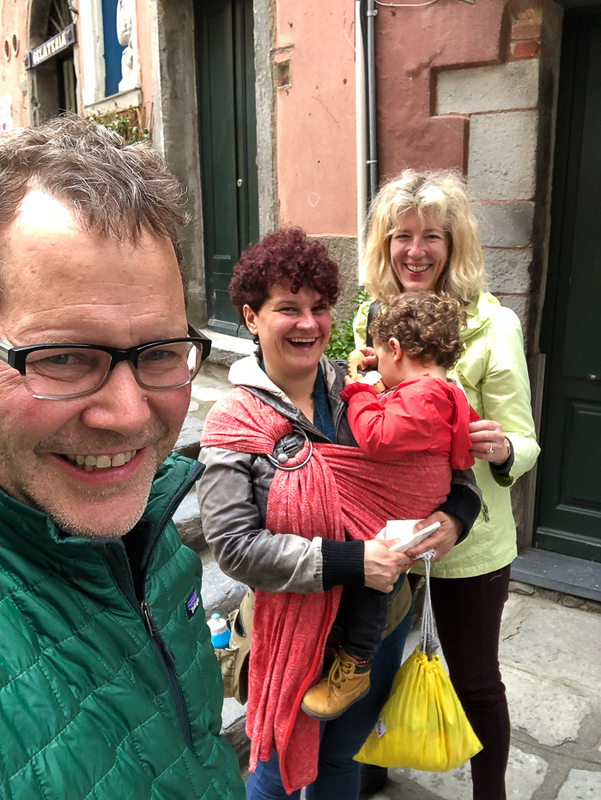 Yesterday we tried to tour the town of Manarola, just south of Vernazza, via the milk-run locomotive that connects the five villages. Before the region’s devastating flood and mudslides of 2011, the well-loved hiking trail also connected all the villages. (During our previous trip here in 2010, we purchased a trail pass and blasted through the entire route in one day.) Since the mudslides, two major sections of the trail remain closed. We decided to purchase a day-pass for the train since we planned to ride it back and forth. I asked the middle-aged ticket agent at Vernazza’s train station for a train pass. “Train is closed?” I questioned. “Yes, closed”, he answered, just as a train pulled into the station. “Can we take this train?” I asked, noticing that it pointed north to the Cinque Terre town of Monterosso. We paid for the tickets and ran to the train, unsure how we’d return to Vernazza on a closed route. But with the recklessness of travelers, we jumped onboard anyway. Jim owns one of those annoying watches that tracks your number of miles and flights of stairs each day. (Jim interjects: “What you call annoying, I call super-cool!”) Normally he follows the milage, but here he’s all about the stairs. And everything is up, up, up. 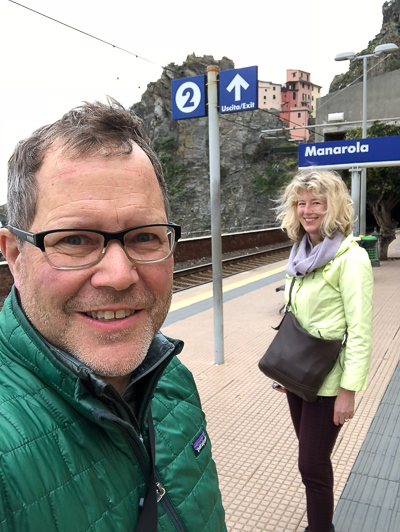 This morning we took the train to Manarola (yes, it went there just fine) where we scoured the hills before the rains and three train cars full of Japanese tourists hit. Jim got some awesome photos for future paintings while tracking our flight climbing at 57. Our calves hurt. We clocked a dozen of today’s flights of stairs during two returns to our apartment. From the street we take four flights to reach our outer door. Directly inside this door is another flight of stairs. At the top is our actual apartment door, with another flight immediately inside that. Finally we reach our apartment, but it spans two stories--the main floor is still one level higher. 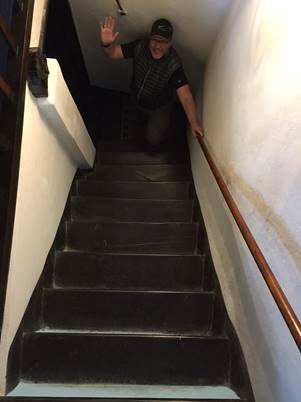 Climbing the narrow stairs inside our apartment requires careful footing due to the steep and shallow steps. Calling them stairs is generous: they’re more ladder-like. The apartment has a rustic decor and proudly describes one of the bathrooms as “70’s style.” We have an ancient piano and a huge armoire and can’t fathom how they got either up here. Jim says it reminds him of those miniature ships-in-a-bottle. How had these stairs given birth to such furniture? Only later did I notice a pair of ships-in-a-bottle sitting atop the piano. 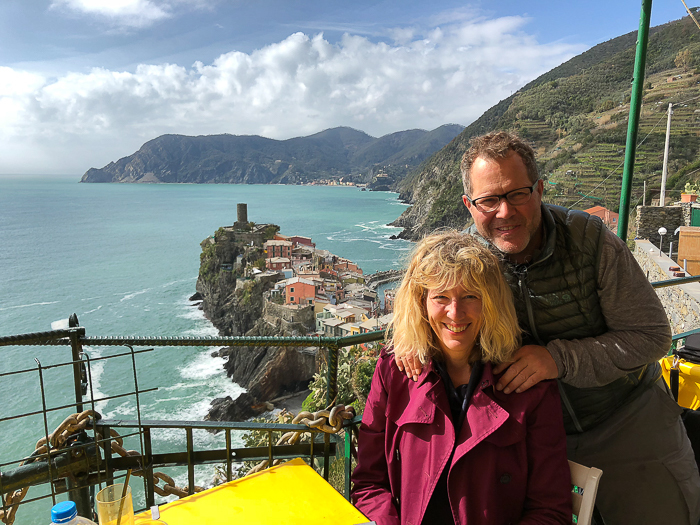 When we visited the Cinque Terre in 2010, we stayed at a hotel in Monterosso, but when Jim saw Vernazza, he said he wanted to stay here someday, despite its lack organized lodging. Back then, with VRBO and Airbnb still in their infancy, renting an apartment, particularly in a foreign country...not so simple. Instead, matrons would greet arriving travelers at Cinque Terre train stations with photos of their guest rooms and offers to rent. We didn’t get to meet any of these boarding house ladies, but we have befriended the “Cannoli Brothers” of Vernazza. 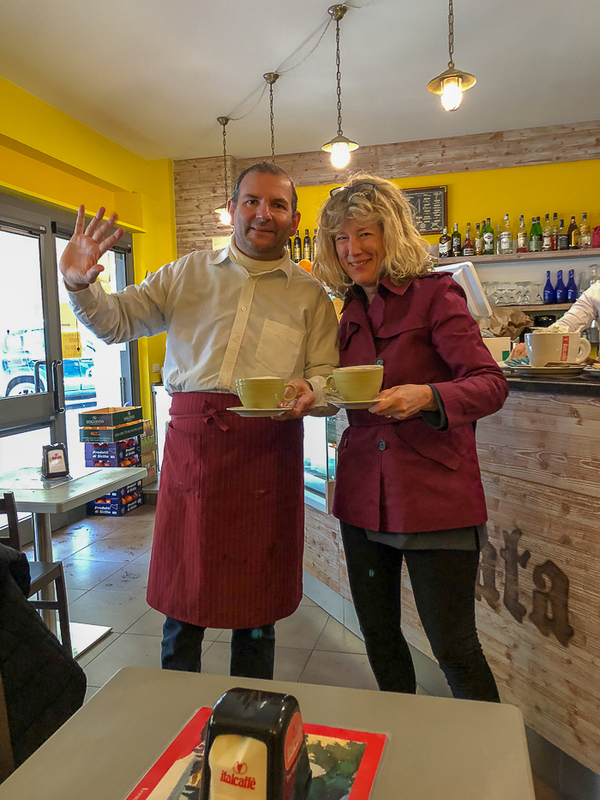 These twins from Sicily run a pastry shop and restaurant at the top of our town and provide us with our daily cappuccinos and croissants during out week here-- though they give me a hard time about my request for decaf. “In Italy, we think decaf is not real coffee,” they insist, needling me one moment, charming me another. The twins rolls their eyes. 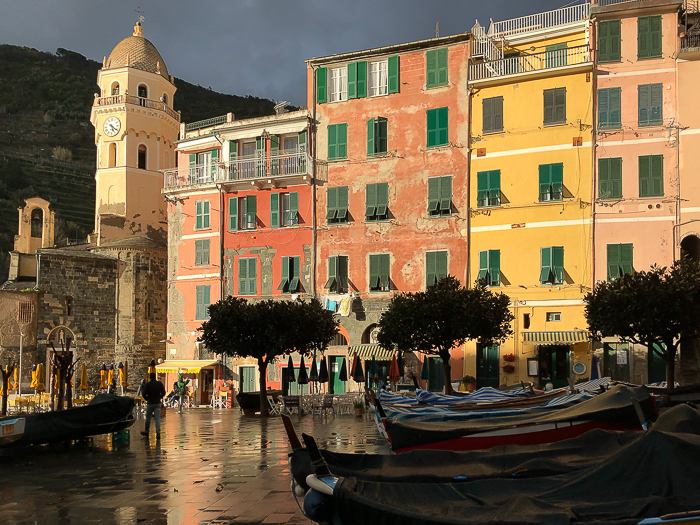 Vernazza, like all the towns of the Cinque Terre, caters to tourists and vacationers, but you won’t find a museum or must-do site here. Instead you see and hear clusters of happy French, German, Japanese, Italian, English and American vacationers strolling the streets. We’ve beaten cruise-ship season by a month, the single reason we came now instead of April. Shippers have discovered the place in a big way, and Jim and I long-ago decided that as travelers, we’d much rather face uncertain weather than crowds. Today’s storm continues, but we still have heat, electricity and all the necessary ingredients from the farmer’s market to make bruschetta. Time to go chop us up some tomatoes and basil. 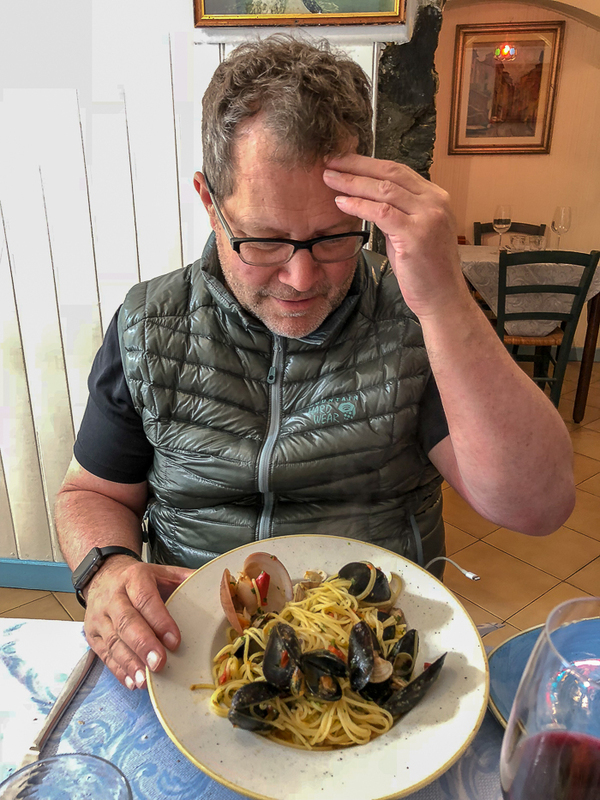 This entry wraps up my Northern Italy 2018 writings as well as most of the trip itself. 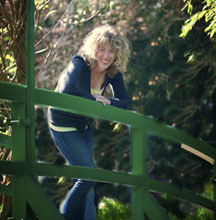 And special thanks to Jim, my beloved photographer, story formatter, travel financier and all-around fantastic guy. I can’t imagine doing this with anyone but you.